The I-20 East Corridor includes the I-20 East Transit Initiative as well as the I-20 East TOD Strategic Plan, information on both can be found below. The Metropolitan Atlanta Rapid Transit Authority (MARTA), in conjunction with DeKalb County and the City of Atlanta, and in cooperation with the Federal Transit Administration (FTA), initiated the I-20 East Transit Initiative to identify transportation and environmental impacts associated with the development of high-capacity transit service from downtown Atlanta to the Mall at Stonecrest in southeastern DeKalb County. The project is intended to improve east-west mobility and accessibility to jobs and housing by providing a high-capacity transit alternative in the I-20 East Corridor. In addition, the project will provide opportunities for economic development and support revitalization efforts as planning partners in the corridor including the City of Atlanta and DeKalb County prepare for anticipated future growth. A Detailed Corridor Analysis (DCA) was completed and the Locally Preferred Alternative (LPA) was adopted by the MARTA Board of Directors in April 2012. The adopted LPA for the corridor includes two components: 1) new bus rapid transit (BRT) service along I-20 between the existing Five Points MARTA station in downtown Atlanta and a new transit center at Wesley Chapel Road and 2) a 12-mile extension of the existing MARTA heavy rail transit (HRT) line from the Indian Creek Station. The HRT line would extend south, adjacent to I-285 to serve the Wesley Chapel Road transit center, and then transition east parallel to I-20 to the Mall at Stonecrest in Southeastern DeKalb County. The BRT and HRT components of the project are being evaluated in separate environmental documents. An Environmental Assessment (EA) is being prepared for the BRT component, and a Draft Environmental Impact Statement (DEIS) is being prepared for the HRT component. Efforts are currently underway to complete the environmental review by finalizing these documents and advance both the BRT and HRT into FTA’s Capital Investment Grant project development, where they will compete for Federal funding. 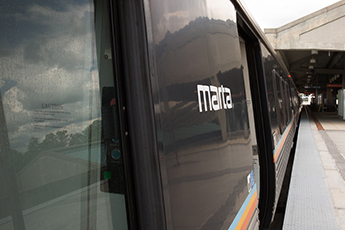 MARTA is also exploring alternative funding sources to cover the projects’ capital and operating costs. 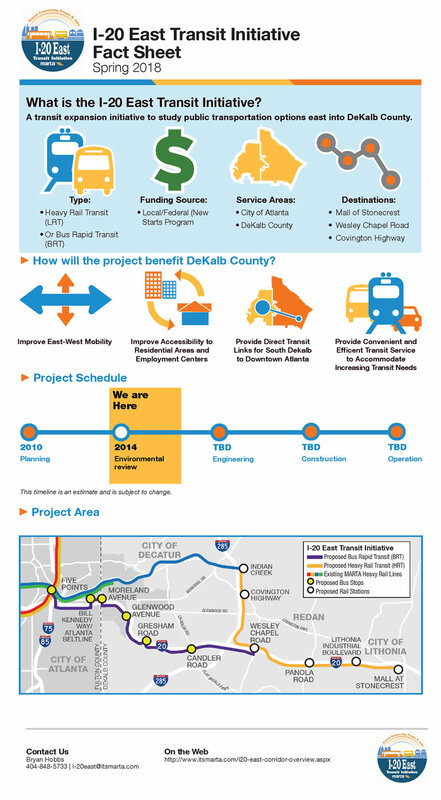 The Metropolitan Atlanta Rapid Transit Authority (MARTA) and DeKalb County are partnering to conduct the I-20 East Transit Oriented Development (TOD) Strategic Plan. Funded by a grant from Federal Transit Administration and contributions from MARTA and DeKalb County, the project kicked off in summer of 2017 and is anticipated to wrap up in winter 2018. The purpose of the TOD Strategic Plan is to create a blueprint for transit supportive development around proposed transit station sites along the I-20 East corridor from Indian Creek Station to the Mall at Stonecrest. TOD is a type of community development that includes a mix of housing, office, retail and other amenities integrated within a walkable environment and centered around quality public transportation. Creating land uses around transit stations that support and promote transit use encourages ridership, which would greatly benefit efforts to implement transit in the corridor. Additionally, the TOD Strategic Plan could help kick-start momentum, interest, and investment in the I-20 East corridor benefiting the community with improved access to housing, amenities, and jobs and an overall improved quality of life. A final output of recommended policies and programs to support TOD along I-20 in the key areas of business and employment development; education and job training; mobility improvements; land use and zoning; and workforce housing. Here you will find links to project documents. The links will be posted as the documents become available. The following presentations were created to provide project related information to the community, Technical Advisory Committee, and Stakeholder Advisory Committee. Please access the links below to view the presentation of choice. Presentations over 5 MB have been noted. This presentation depicts the various alignment options associated with each alternative. The alignment options include connectivity options in the Downtown Atlanta area, alignment options in the Panola Road area, as well as mainline options along I-20 East and an extension of the Blue Line from the Indian Creek Station.